El Cid Shield | BUDK.com - Knives & Swords At The Lowest Prices! 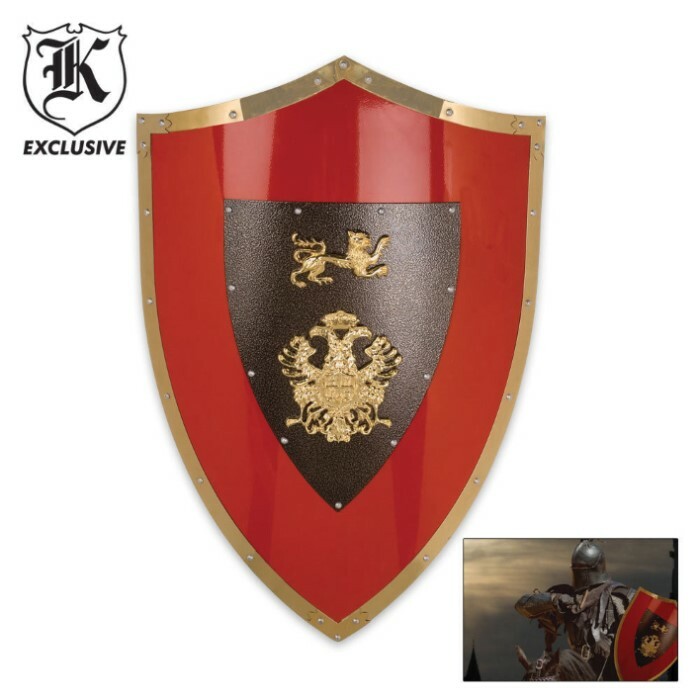 These full size medieval shields are constructed from solid, cold hard steel with full color accents. Each piece offers individual cast metal ornaments created to exactly resemble the original shields wielded by knights centuries ago. Each shield is 24" tall. It has a nice red color to it although the "gold" decorations are still plastic I would recommend it for decoration or if you are going to dress up as a knight for whatever reason. There is a chain for it to be hung on the wall and it has a handle and Velcro strap for you to be able to wield it although I would suggest making your own strap it works for the purpose it was given.